Harriers-Online - 01-08-2009 - A decent performance for a team full of midgets! Date: 01-08-09 A decent performance for a team full of midgets! "A decent performance for a team full of midgets!" Kidderminster Harriers completed an unbeaten pre-season campaign against a drab Port Vale side today in a somewhat less than friendly 2-2 draw. A series of rash challenges from Vale players could have left the Harriers with a string of injuries but luckily everyone pulled through without any knocks with Vale's Lee Collins getting booked for his challenge on Chris McPhee. Nonetheless, a confident performance for Harriers in which to showcase the new blue away kit (below), which many were less than impressed with. With just six minutes on the clock Jamie Guy pounced on a mistake by Dean Coleman. He had parried a shot after being caught out of position and was left flapping at Guy's return shot which was well and truly buried in the back of the empty net. Coleman followed this up with some woeful kicking and an all round disappointing performance from the new Harriers number one. Almost immediately after the kick off Chris McPhee burst through the leaky Vale defence and was one on one with goalkeeper Stuart Tomlinson. He cheekily chipped the ball over the keeper and it cannoned back off the bar and, as Harriers frantically tried to force the ball, home Brian Smikle hit a wayward shot over the bar. Port Vale were lively early in the game but tired quickly and gave Harriers several chances to get back into it. Vale finally succumbed to this eventuality after eighteen minutes and again Chris McPhee was the star volleying home from a Kyle Hadley corner. This came just after he'd had a shot blocked from a Smikle cross. Smikle continued his good vein of form working well with Darryl Knights throughout. Jamie Guy went close again for Vale as Coleman watched his shot thankfully whistle past the post for a goal kick. Kidderminster took the lead 10 minutes before half time, a spectacular diving header from Dean Bennett, taken well from another cross provided by Kyle Hadley. With half time approaching, the Harriers were dominating the game with Port Vale looking shaky. Vale made several changes to start the second half before their frustration began to show with two dangerous challenges one after the other, first Rob Taylor going straight through Dean Bennett and somehow escaping a booking, then Lee Collins did get a booking for his foul on Chris McPhee. Mistakes are often costly and a mix up in defence let Vale's consistent striker Marc Richards burst through on goal on the hour mark. 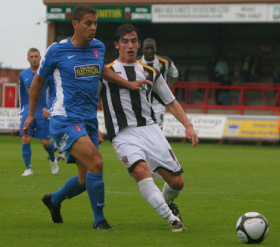 He rounded Dean Coleman with ease before sliding the ball into the empty net in front of the 70 travelling fans. McPhee hit the bar again when Smikle flicked the ball out from Baker's cross but the whistle had already gone because Smikle had somehow fouled Geoff Horsfield. Knights then forced an acrobatic save out of the substitute keeper, Chris Martin, in similar circumstances. In the middle of a string of substitutions Kyle Hadley picked up the ball near the half way line, he took on two defenders before letting rip with a shot which curled just inches wide and brought rapturous applause from the Aggborough faithful. This was another good performance, against a capable League Two side, giving positive signs going into the new season. First though the Worcestershire Senior Cup final at St. Georges Lane against Evesham..